Alex Clarke at Denison Yacht Sales asks me to broadcast a $200,000 price cut on the 22.2m 2010 Donzi R73 sportsfisherman he has for sale. Accommodation is for eight guests in four staterooms and twin MTU 16V 2000 engines give her a cruising speed of 34 knots. She's being sold as a new boat with a full manufacturers & engine warranty that goes into effect once the vessel is sold. 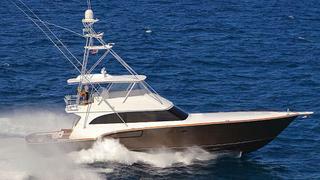 Lying in Fort Lauderdale the Donzi R73 is now asking $4.7 million.